As I wrote in last week’s article, How To Find Yourself By Doing What You Love, I was a wreck in my earlier years and my skin reflected it: the skin on my abdomen looked mottled and I had an incessant allergic-looking rash on my arms. It wasn’t noticeable to others because it was mild, but I knew it was there. Doctors that I visited prescribed creams & ointments, which did nothing to relieve my skin condition. I also started having issues with dry & brittle hair. It was a mess! I began to read everything I could about skin & skin care products. The more I learned, the less I trusted the products that were advertised as “good for your hair & skin” and the more I understood that the condition of my skin was a perfect mirror for the dis-ease in my body. For example, poor thyroid function can cause dry & brittle skin and nails. The skin is a major organ, as is the heart, the kidneys, and the lungs. You can nourish your skin with a healthy lifestyle and some natural remedies. It’s important to know what products to use and what to consume as well as what to stay away from so you can pamper your skin from the inside out. Your food makes up your tissues & cells. Water, essential fatty acids, antioxidants, and super foods offer superpower nutrients for your skin. Yes, chocolate is on the list. Did you know that topical application of magnesium gel, for example, is an amazing way to add magnesium to our body without the normal side effects of oral magnesium intake? What you apply to your skin is absorbed into your blood stream. I use a variety of oils, such as: coconut, almond, sesame, and jojoba oils, as well as a variety of essential oils on my skin. 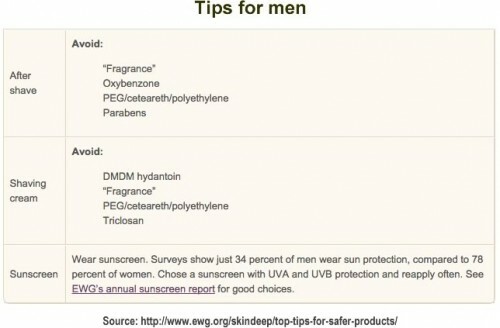 Sunscreen is an important product to many of us. 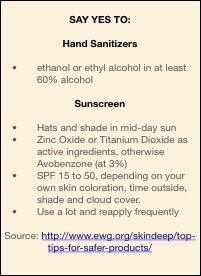 I highly recommend the Environmental Working Group’s guide on sunscreens (http://www.ewg.org/sunscreens). How do you look after a poor night’s sleep? That’s right! Sleep Matters!!! The quality of your sleep, as well as the quantity of sleep that you get has an impact on your entire body! Many years ago, I was introduced to the concept of Dry Skin Brushing by my dear teacher and mentor, Dr. Bruce Berkowsky. According to Dr. Berkowsky, “Vital Chi Skin-Brushing can sustain or re-establish the skin’s functional integrity and youthful glow”. Just like what you eat affects your skin’s health, what you put on your skin affects your health. 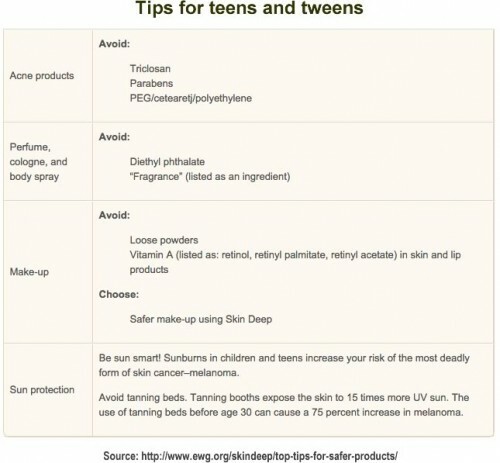 Over 10,500 unique chemicals are used as ingredients in personal care products and NO PREMARKET SAFETY TESTING IS REQUIRED. Phthalates – Phthalates are industrial chemicals that are used as ingredients in both plastics and skincare products. Research studies have linked phthalates to reduced fertility and have been found to block the action of key hormones, resulting in inhibited sexual development. Babies are more susceptible to the effects of these toxins. 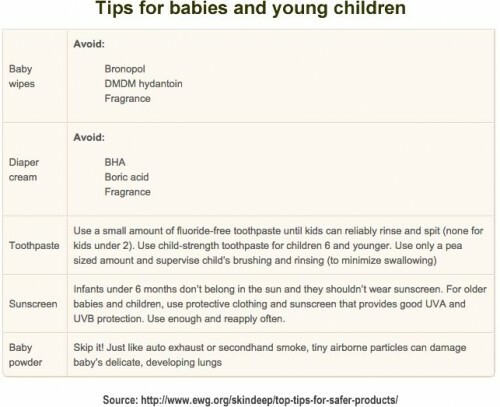 Baby products containing phthalates are widely used. Recent research at the University of Washington found phthalate breakdown products in the urine of babies that were in the study (81% of the babies studied showed 7 or more phthalates). Parabens – Parabens are preservatives (to prevent fungal and bacterial growth in the products) that mimic estrogen once absorbed by the body. One study found parabens in breast tumors. They are widely used in cosmetics. It is believed that all parabens can be found in all American bodies. According to the European Commission’s Scientific Committee on Consumer Products, some parabens are endocrine disruptors which can cause reproductive and developmental disorders. Isothiazolinones – These are compounds listed as Methylisothiazolinone, methylchloroisothiazolinone, benzisothiazolinone (look for ingredients listing “chloro” or “methyl” on the label). 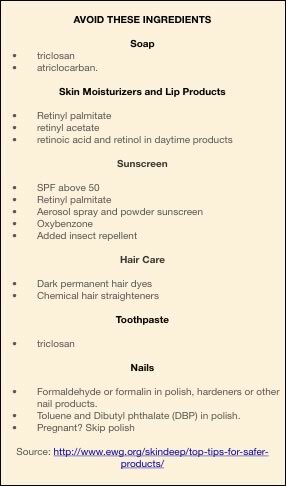 These compounds are used as preservatives in hair dye, shampoo, shaving cream, body wash, and other products and are among the most common irritants, sensitizers, and allergens. Lab studies suggest that these compounds may be neurotoxic. Talc – Even though talc is a mineral, when it is used in talcum powder and cosmetics, it can pose a hazard. Research on this issue goes back to at least 1971, when a study found that 75% of ovarian tumors studied contained talc particles. When the particles are inhaled, it could cause respiratory distress. A wonderful resource available to consumers is the Environmental Working Group (EWG). I trust them because they are nonprofit and nonpartisan. Their sole mission is to protect consumers. 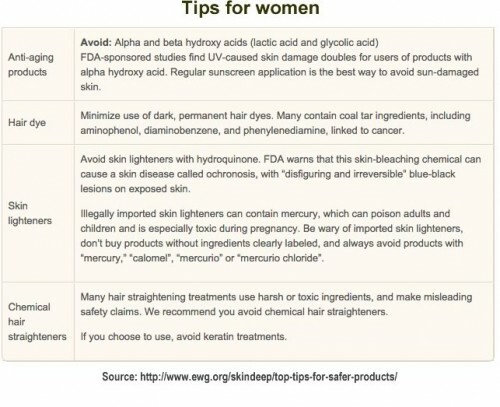 You can find out more about toxic ingredients at the EWG website and you can use their app (http://www.ewg.org/skindeep/app/) to check ingredients while shopping. Use health promoting personal care products and cosmetics. Protect Your Skin by avoiding toxins in personal care products, cosmetics, cleaning agents, and the environment.